This play is based on the traditional Ojibway belief about the struggle to overcome the inner beast that can be released by starvation. It was one of my earliest plays for young people, and the subject matter, cannibalism, made some people nervous. But not the kids. The original production, directed by the greatly talented Brian Richmond, was riveting. I was delighted when the play was later produced by an Ojibway theatre company—and fascinated to hear it was performed by the Chung Ying company of Hong Kong in Cantonese. Those are two productions I wish I’d seen. 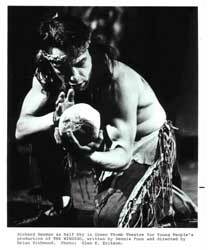 “Dennis Foon’s play is a rendition of an old Ojibway legend about the Windigo, the hunger spirit who feeds on lack of food, entering the soul of the starving hunter and making him ready to kill those he loves. The most descriptive compliment one can give Foon is to say that he manages to capture the quality of simple and evocative eloquence that is the hallmark of good tales of folklore. There is a strong sense of magic as Foon develops his human tapestry interlaced with shades of light and shadow. Cheap gimmicks of fake sorcery are avoided—no phony monsters and no elaborate special effects. Instead, we get simple, human characters. There’s the struggle between the Windigo and the good-in-all-senses-of-the-word hunter Half Sky, but that is shown as a man struggling with himself. The situation leading to that struggle is credibly established with a simple romantic triangle plot.